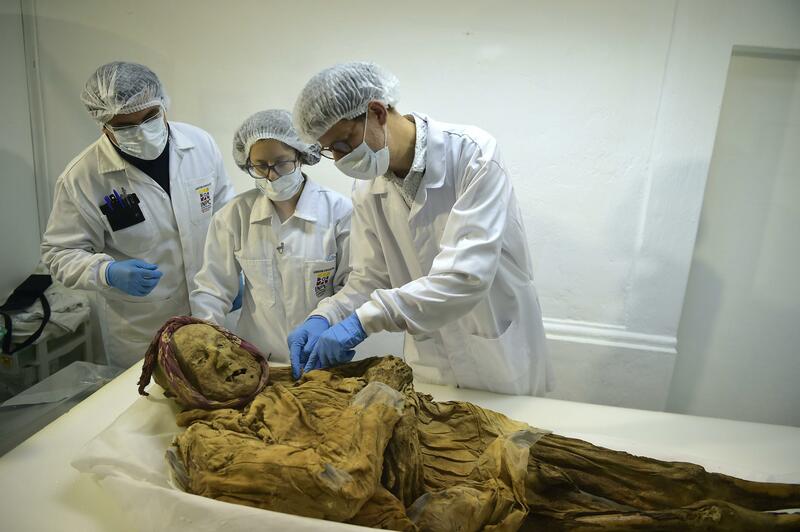 The naturally mummified remains of an adult male found in the town Guano, in Ecuador’s Chimborazo Province, is being studied to learn about the spread of rheumatoid arthritis. The Guano Mummy was discovered after an earthquake struck the town on August 5th, 1949. In the rubble of the Asunción Church, rescuers found the well-preserved remains of a man wedged between two of only three sections of walls that remained of the 400-year-old church. The man was positioned vertically, as if standing, between the walls. He had not deliberately mummified, and neither was the mummified mouse found next to him. It seems the body was sprinkled with lime to speed decomposition but instead the dry, cold conditions preserved his tissues (and those of the unfortunate rodent) in excellent condition. His clothing also survived in remarkably fine fettle. There was a purple scarf wrapped around his jaw (perhaps to keep his mouth from gaping open) and a long white robe covering his body. After its discovery, the mummy was moved to the town library where it was displayed in less than adequate conditions which caused some deterioration of the organic remains. In 2003, a team of researchers from the US did a thorough study of the mummy, X-raying and carbon-dating it to the 16th century. The date coupled with archival research pointed to a possible candidate for the identity of the mummy: Fray Lázaro de la Cruz de Santofimia, a Franciscan monk who traveled to Guano from Spain to take charge of the religious community there. Asunción Church was built between approximately 1560 and 1572, commissioned by the Franciscan missionaries who were evangelizing the indigenous Puruhá culture. Later a monastery and cemetery would be built next to the church. Fray Lázaro’s position as the first guardian of the church and monastery could have been the reason he was buried in such an unusual position and location, standing guard over his charges for eternity, as it were. 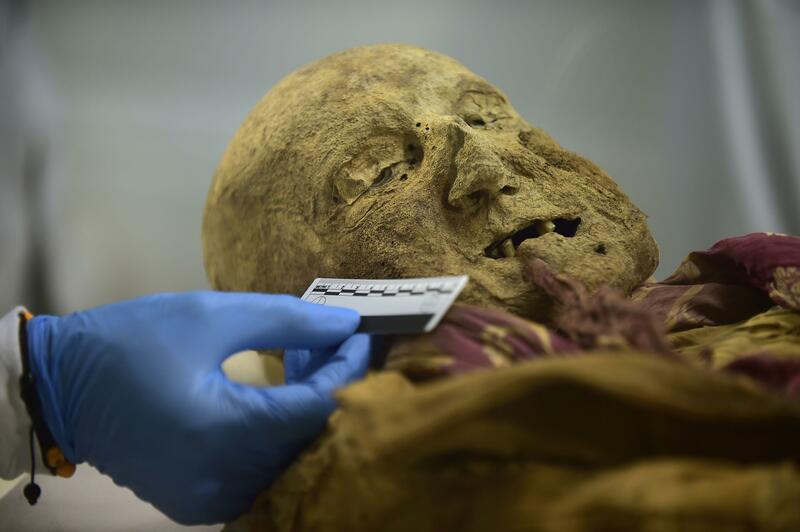 French pathologist Dr. Philippe Charlier and his team spent two days studying the mummy and taking samples at the laboratory of the National Institute of Cultural Heritage in Quito. One major draw is the evidence of rheumatoid arthritis found in the surviving tissue. Rheumatoid arthritis was first found in America before the arrival of Christopher Columbus. The examination has found a likely cause of death: a chin fistula that became infected and caused fatal sepsis. Charlier’s study will also perform a new radiocarbon analysis and DNA analysis (RA is associated with several genetic markers). The dating and genetic testing may help confirm or deny the mummy’s identity. He questions the Fray Lázaro identification because the man was not dressed in the usual Franciscan garb — the textiles are more expensive than the brown homespun of the monk’s habit — nor was he interred with expected Christian accouterments like a rosary and coffin.